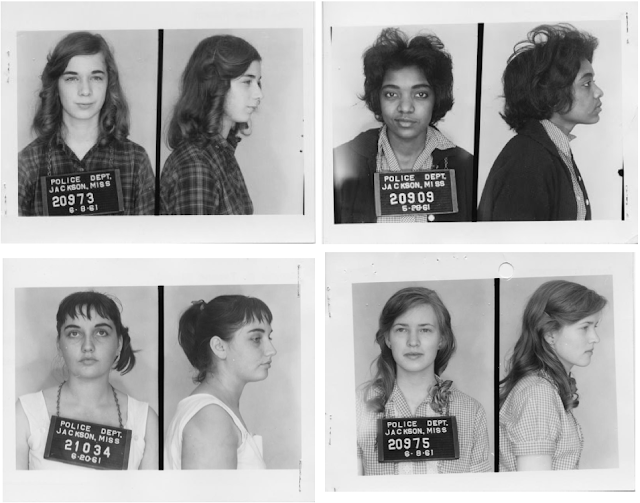 - Mug shots of some of the many volunteer civil rights activists who rode interstate buses into the segregated South in 1961 sourced from Breach of Peace: Portraits of the 1961 Mississippi Freedom Riders. Okay, all of that has nothing to do with this post, it will be a random mash-up of thoughts and tid bits. We were supposed to leave for Portland on Sunday afternoon... and we are STILL here. It turns out we underestimated packing a little bit, as well as were just super busy. Portland isn't going anywhere, so we aren't stressed out or anything, spirits are still high! The good news is we are leaving tonight, finally! It is sort of surreal leaving here and our now empty house, this was our first/only house we've lived in since getting married. Did this count as New Year's themed post? I'm never very good at those. But if I had to make a 'resolution' it would just be to enjoy everyday/every person a whole lot more. No matter how good you think you're doing, there is always room to love people more. I for SURE have room to work on that! I hope you all are doing just great and I apologize for the long and rambling post! breach of peace has been on my wishlist for a while now! sadly, santa didn't bring it to me this year. it makes history so much more powerful when you can see the people involved, don't you think? Happy Movin' Day to you!!! Happy New Year, dear! Here's to a safe trip to Portland! Good luck with the move! Portland will welcome you with open arms. "More recipe posts! I am in DESPERATE need of eating healthier, I practically fall asleep dreaming of vegetables and miso soup ( I sing a song anytime I make/think about/eat miso soup, it involves the words "oh miso soupy"... I am a five year old)" Oh gosh, this is SO like me. Loved your post - YOU CAN DO IT! All of IT! EVERYTHING! :D Hang in there! Happy 2012! I'm excited!! I'd also love if you would offer some of your drawings on Etsy or something, I just adore the one on your business card/header! I just added this book to my wishlist. It's so easy to forget just how young the Civil Rights activists were, since they were our parents' and for some, grandparents' generation. I'm excited to see what you are going to do with screen printing. I've been thinking about getting into that, too, as I think it'd be something my daughter and I could do together. I hope by now you are back in safe in Portland. "There is always room to love people more" I like this phrase very much, hatred, envy, or any negative feelings should be vanished and just focus on loving and caring to other people. We made it safe and sound!! And I couldn't agree more with your sentiments, there is so much yucky stuff in the world already... why add to it with negativity!